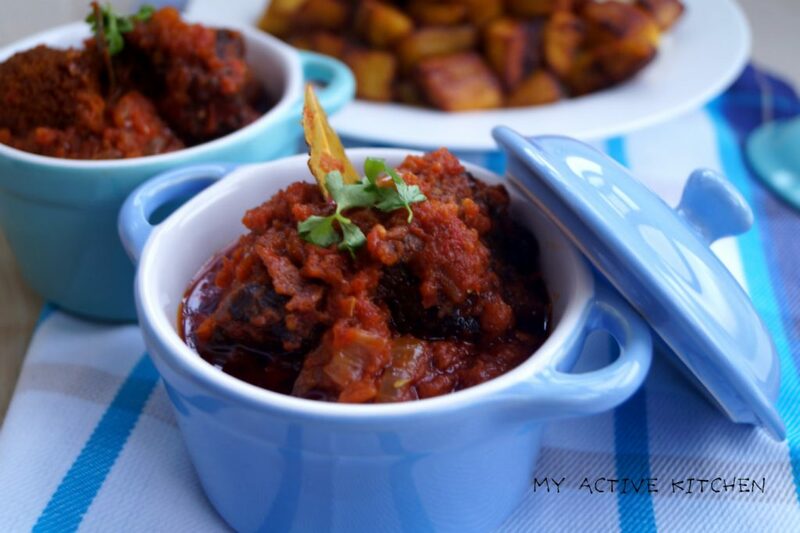 This fried stew (obe dindin) right here is a popular versatile dish in every Nigerian household. 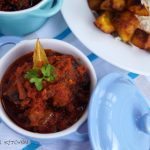 It is present at every party and if you have been to a boarding school before, this is the kind of stew that mamma will definitely package in a tin for you and it can last for quite some days. 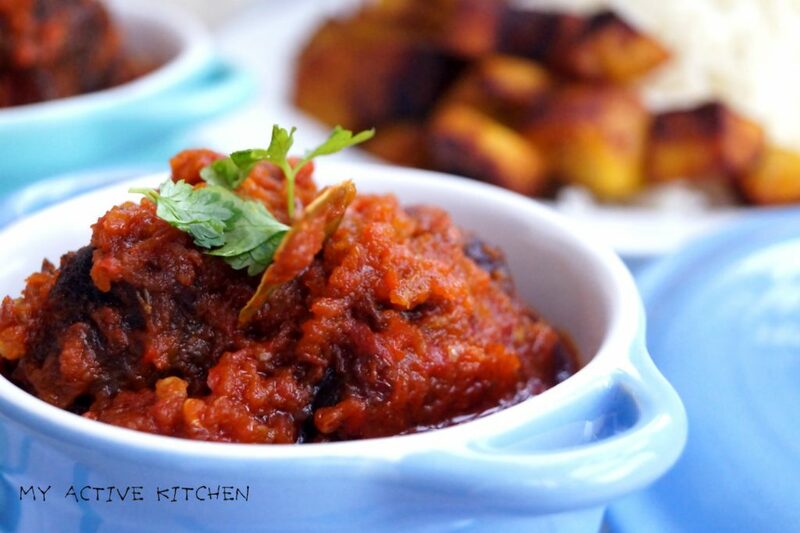 The meat is always deep fried or grilled and that also helps in keeping the fried stew last for long. Like every other stew I have on the blog, this is one of the easiest you can make and a little goes a long way. I added curry, thyme and parsley to this stew but these are optional. 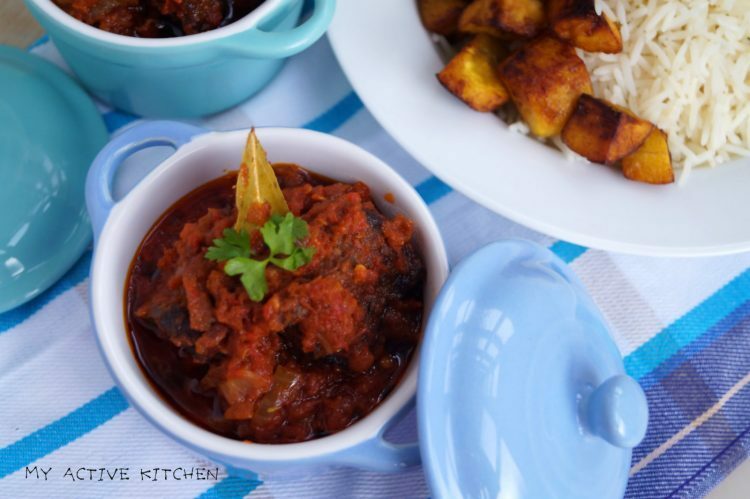 If you want the real Nigerian party stew taste, add curry and thyme. I hardly cook any other type of stew with curry and thyme and I never use the spices when I’m using palm oil. 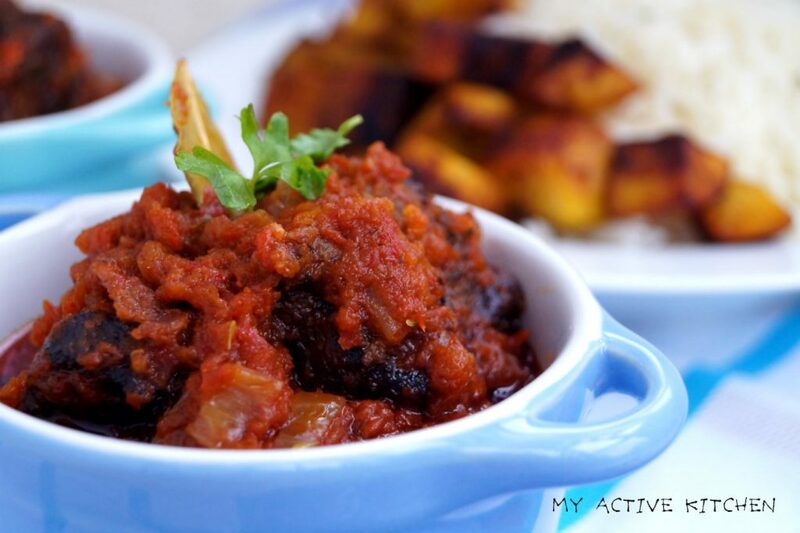 This recipe only calls for vegetable oil and after frying the stew, you can scoop the oil off. Add vegetable oil to a pan on medium heat, add chopped onions and cook on low heat, add a teaspoon of curry and thyme and continue to fry on low heat. Keep an eye on it to avoid burning. Add the blended pepper to the oil and stir to combine, add bay leaves. Continue to cook for another 10-15 minute, add water and stock if the sauce is becoming too thick but don’t let it be too light. You are trying to achieve a well cooked fried stew. Add seasoning and salt to the sauce and stir to combine. Add the fried or grilled meat and stir together. Finally, add dried parsley if using and stir to combine. 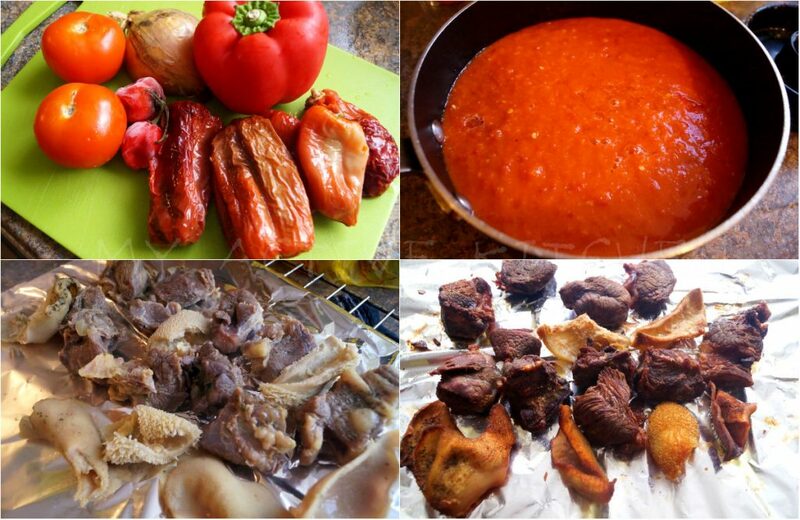 Continue to cook the stew till oil floats and the surface and stew is well fried but not burnt. Wash and rinse the assorted beef clean, season with salt, onions, bouillon cubes, curry and thyme and bring to boil till tender, drain on a colander (keep stock), deep fry or grill till golden brown. Add the boiled pepper to the oil and stir to combine, add bay leaves. Continue to cook for another 10-15 minute, add water and stock if the sauce is becoming too thick but don’t let it be too light. You are trying to achieve a well cooked fried stew. Add dried parsley if using and stir to combine. Continue to cook the stew for another 10 minutes or till oil floats and the surface and stew is well fried but not burnt. Use fresh tatashe (red bell pepper) if you don't have dried ones. Finally, as always lovelies, if you make this recipe, please leave a comment for me. Also, pin this recipe on Pinterest or tag me your beautiful yummy image on Instagram.